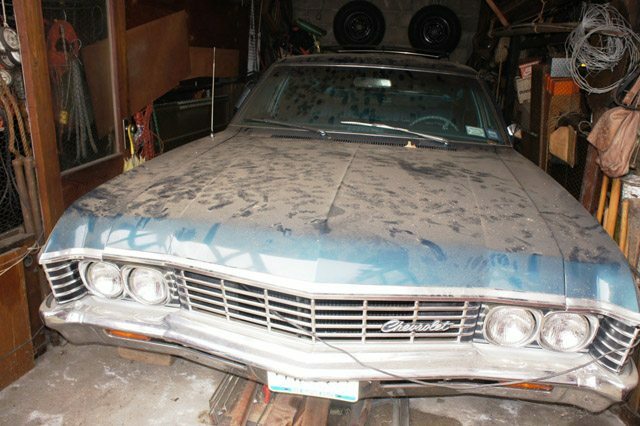 Pictures of a dusty car in a cramped storage space lends evidence that this Ebay find 1967 Chevrolet Impala 9 passenger station wagon hasn’t seen the light of day for some time. A good cleaning has revealed a very solid 31,000 mile gem of a car that is said to start right up and purr. 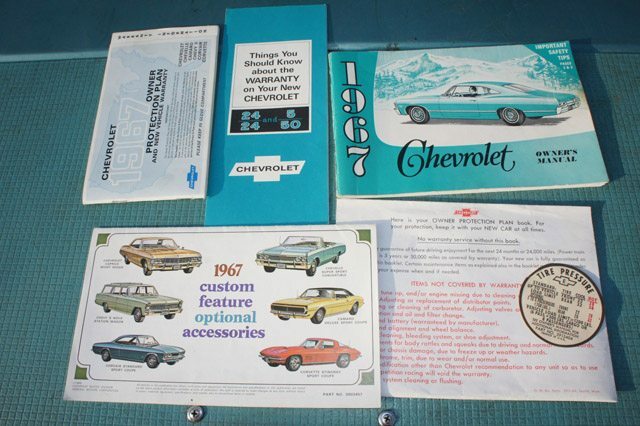 No mention is made of how long the Tahoe Turquoise Impala sat but a thorough fluid replacement would be a wise choice to ensure mechanical longevity. 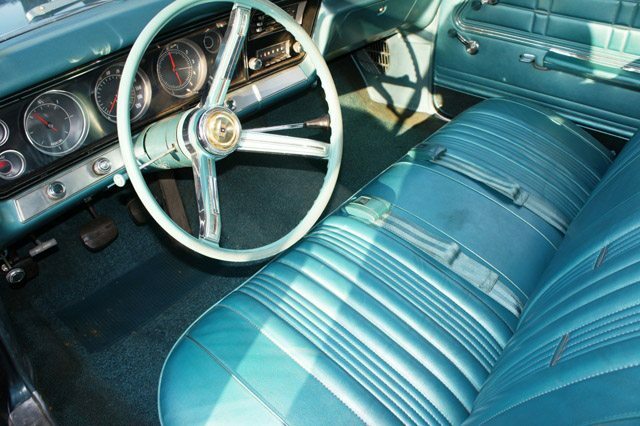 Unusual for an Impala is the 4 speed column shift manual transmission and dog dish hubcaps. With the manual transmission, the 283c.i. 190 hp should be adequate power for the big wagon. As nice as this car looks, some further detailing could really bring it to the next level. Some minor work is needed to fix a few minor scrapes and dings and an easy engine compartment detail would also help. A 1967-1970 student sticker on the rear bumper still looks fresh 45 years later. 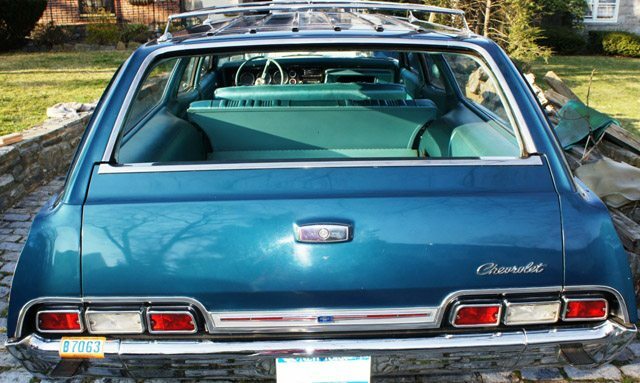 A few minor dings can be seen along with a scrape next to the Impala badge. 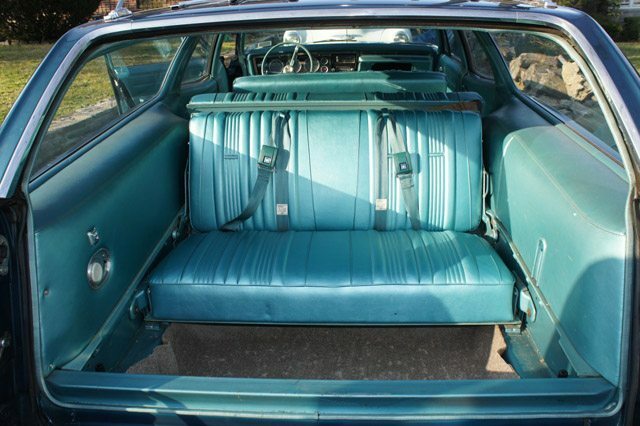 The interior look practically untouched. The only signs of wear are in the carpet where some fading is evident. 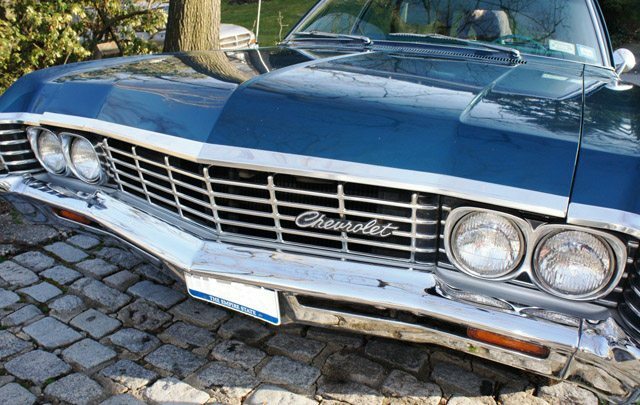 The seller says the interior still has a new car smell. A nice collection of original documentation is included. 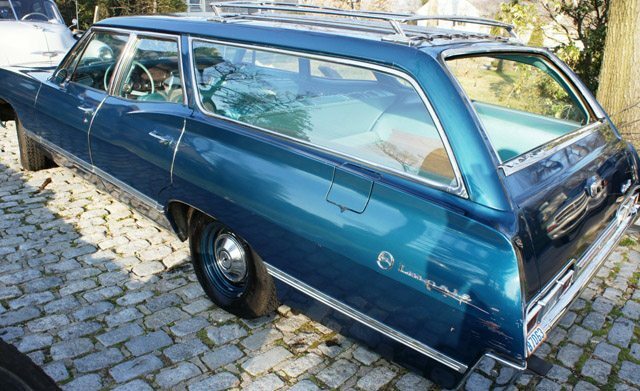 That is one sweet wagon! 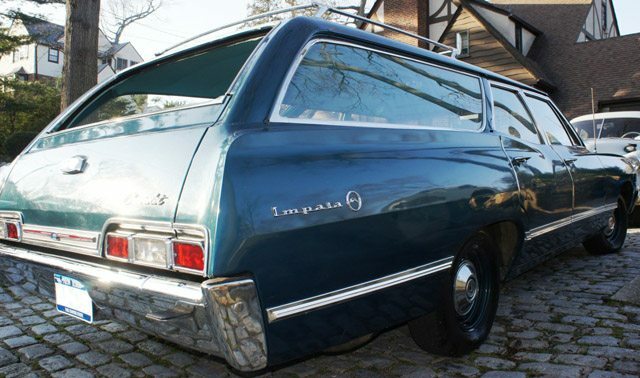 I used to drive for a grocery delivery service in Brooklyn in 1978 and we had so many beater wagons like this! You couldn’t kill these cars! I’d give a kidney to have one today! yellow, black interior, 275 hp-327 powergluide with ac no longer but will be my driver. with LS3-4l60e someday and I would love to have this one ready to enjoy now.. 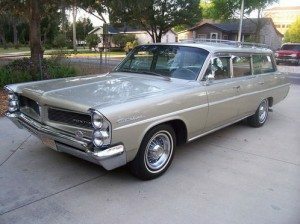 This was the car my father took me to pre school in and family vacations. His was white with teal interior. I was really little when my older brother wrecked the car and totaled it out. My father was sick. 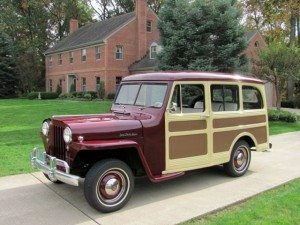 Would have liked to drive one for old time sake. 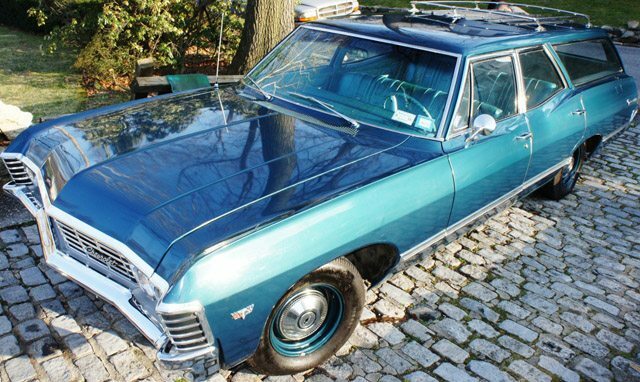 A rare Impala indeed with column shift, dog dish, and unlighted front corners (whatever those are called). 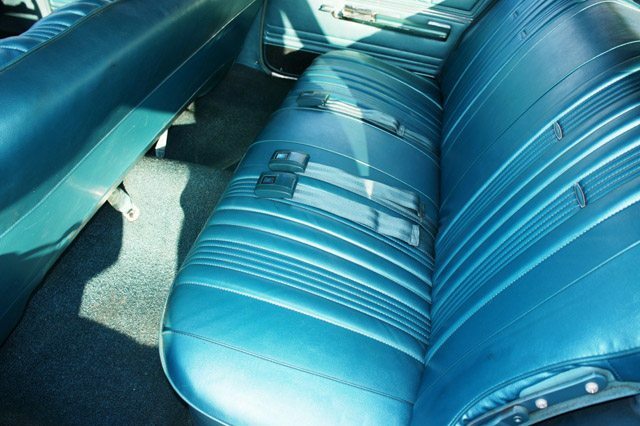 The interior is mildly above the Bel Air, the model in our family until about 1985. It appears you got the bumper steps not seen too often. That small V8 is plenty strong for the car. Lucky you. Enjoy! 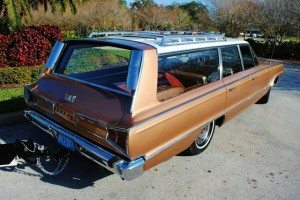 This is a one family wagon, my Mom & Dad got it new after he retired, They made a trip to Florida to see family, and a few fishing trips, not very far from home, to the store about once a month and to doctor. They are both gone now and I am retired and don’t really drive if anymore. It has less the 60,000 miles I would have to look to be sure. It has mostly been in the garage an now in our pole barn. That was my Dads pride and joy, he always to good care of everything he had. It doesn’t show any ware, There is a little rust next to front door (back edge of fender. There is a small scratch mark on one side that happened when Mom was at the store. I have been doing some research and I think $15,000. would be a good price as it is all original and dusty. If you are really interested send me an email and I will send you more info and pictures. I don’t really want to get rid of it but we are not getting any younger. The article mentions that the car has a 4 speed manual on the column…This is more likely to be a 3 speed on the column…not a 4 speed unless someone converted a 4 speed floor shift to a column shift. The 3 speed manual was standard. 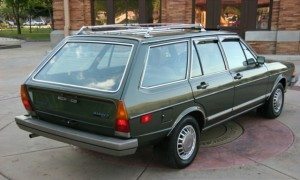 My dad had one of these except his was the 396 turbojet with 325hp and the 400 turbo trans it was a great car. I have four dog dish hub caps w/ Chevy emblem in the center . I have never heard of column shift 4 speed car. is this true and where can I find information on this option. 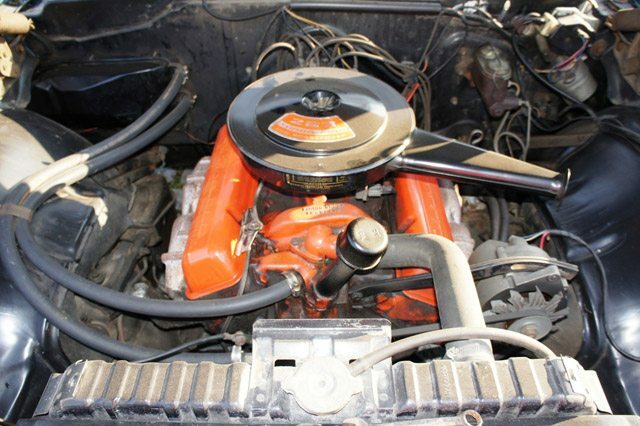 I’m resto-moding my 1967 Biscayne in to 350 LT1, muncie 4 speed on the floor.